My last vacation day to be spent on cycling activities and I was able to head down to Limburg again. This time my buddy Robert went along, which was nice but he has never climbed any serious hills before. Therefore we kept the ride a bit short, only 30 km and about 1,5 hours. 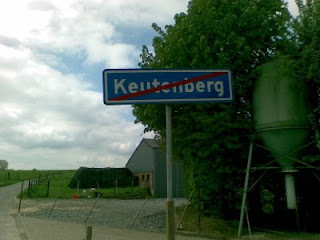 We started off again in my favorite village of Schoonbron and went up the Keutenberg. The picture on the top right shows that we reached the top of the climb and could cross this one off our list. We then toured on a bit further, even being cheered by a group of hikers, before heading up the Gulperberg. The picture on the right is of my buddy Robert trudging up the last steep bit before reaching the top. He was asking when we were stopping for some coffee at this point... but there was more in the planning. 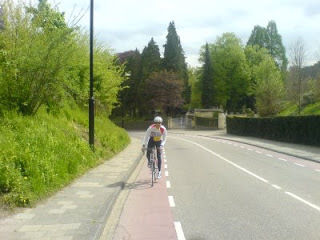 No first timer to climbing in Limburg can miss the Cauberg, so we headed back through Gulpen, Wittem, Partij, Schijn op Geul, and on into Valkenburg to the Cauberg. I have never had the chance to have someone shoot a picture of me climbing this famous cat. 4 "Dutch mountain" so had Robert go on ahead a bit to catch me on the way up. 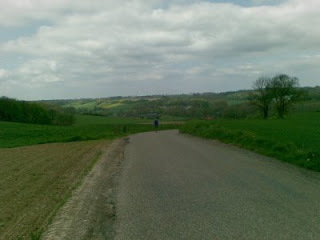 The final photo shows me at about the half way mark, chugging away (standing) on the bike. We finished up the afternoon with spaghetti in Valkenburg before heading back to the car and on back home. The bike computer showed over 1300 calories burned, so I was pushing it up the hills pretty good!